The year was 2045 AD. It was the era of ultra-sensitive long-range high capacity satellites. Means of covering news events had been revolutionized since the twenties and it was the age of instant news. Eckhart Tomlinson the media Moghul and the owner of the greatest news service of all-time, the Eckhart Instant News walked into his office after lunch. He looked at his personal robot which conveyed instant news to him by flashing it on a large multi-purpose computer screen on the wall of his office. In addition, the robot could also speak and inform Eckhart about major news events. He had named the robot ‘Insta-newsmaker’. The robot was connected to a network of satellites covering every point on earth. Eckhart’s newsmen, who were spread all over the world, would feed data in code language into hand-held devices the minute they sensed any news item in any part of the world. The satellite network would then pick up the data and convey it to ‘Insta-newsmaker’. The robot would finally alert Eckhart and he would direct operations from the nerve center of the Eckhart Instant News in Los Angeles, California, USA. ‘Well, how are things Insta, anything for me?’ Eckart asked the robot as soon as he entered. Suddenly the screen on the wall in front of him flickered and there appeared a large globe which was lit up with multiple colors. A guttural voice sounding very metallic filled up the room. Eckhart looked up in surprise. This was not Insta’s usual voice. ‘Who… Who are you…’ Eckhart stammered. The voice continued, ‘We come from the IGCLECP or the Inter-Galactic Council for Life Essence Control of Planets. We have taken control of all your satellites and we are happy to note that what we have to say will reach each one of you. We need your attention for the next five minutes. We wish to convey a very important message to all of you. The function of the IGCLECP is to do a periodic survey of the various planets of the universe and keep a check to see if the life-giving essence for each planet is being maintained by the inhabitants. We visit planets in intervals of thousand years to make a survey. Though you are not aware of the existence of life-forms in other planets, we assure you that there are millions of planets in this universe that sustain life. You are not the only one. Your planet sustains life based on the life-giving gas called Oxygen with the help of which you burn food that you ingest to produce energy. Life forms in other planets use other gases because they have a different physiology. The voice continued unperturbed, ‘At that time the evergreen forests of your planet and the beautiful rivers were intact. But in this visit, we find that the greenery of this planet has diminished remarkably. We find you are rampantly destroying the flora and fauna that absorb carbon-di-oxide and emit Oxygen which you use for respiratory processes. On your planet, life is sustained by Oxygen. I am quite sure that we of the IGCLECP do not have to underline the importance of Oxygen for your survival. 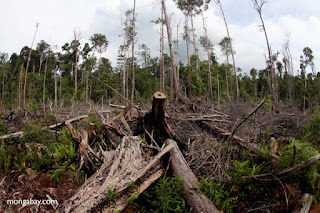 You are destroying these very same forests that sustain you in order to expand the concrete jungles you call cities. Forests are also necessary for the other living species of your planet as they are a habitat for these species. Eighty percent of the earth’s species live in forests. Just imagine an earth where there are no majestic lions or tigers, no beautiful birds, no hares or swans. Would you like to live on such a planet? You would not and cannot survive a day on such a planet because you are dependent on other species for your own survival. Destroying forests also affects the environment and causes climate change. The soil in the forest is moist, but if you remove the cover provided by trees, what ensues? The soil dries out. Trees also return water-vapor to the atmosphere. If there are no trees, lands become barren and turn into deserts. Trees form a canopy for the forests which block the heat of the Sun during the day and hold in heat at night. If you destroy the trees you stop this essential function, and this leads to extreme temperature swings resulting in abnormal weather. We are aware that you are already observing the phenomenon of Global Warming and experiencing erratic behavior in climatic conditions. You are aware of all these problems. We are sure that it does not require a species like us with an intelligence ten times superior to yours to make you understand these simple facts. You know, and you are aware of all these things. Yet what do you do? You go on destroying forests and build city after city because the populations of your countries keep increasing manifold. We of the IGCLECP have been watching you ever since the first ancestor of the homo-sapiens stood erect in the jungles of Africa. You have the capacity to control things around you, but you simply lack the capacity to govern yourselves. Please do not mistake our intentions. We of the ICGLECP want you to survive and flourish. We do not wish to harm you. So, after several discussions, we have come to a conclusion.